About 1/3 of alligator nests are destroyed by predators (mainly raccoon's) or flooding. The average clutch size of an alligator nest is 38. For nests that survive predators and flooding, an estimated 24 live hatchlings will emerge. Only 10 alligator hatchlings will live to one year. Of these yearlings, 8 will become sub-adults (reach 4 feet in length). The number of sub-adults that reach maturity (6 feet in length) is approximately 5. These estimates are for a growing alligator population. As a population matures (and has a higher percentage of large alligators), the survival rate would be expected to be lower, in part due to a higher rate of cannibalism. Food Habits: Alligators are opportunistic feeders. Their diets include prey species that are abundant and easily accessible. Juvenile alligators eat primarily insects, amphibians, small fish, and other invertebrates. 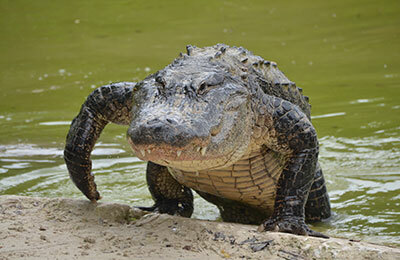 Adult alligators eat rough fish, snakes, turtles, small mammals, and birds. Reproduction: Nearly all alligators become sexually mature by the time they reach approximately 7 feet in length although females can reach maturity at 6 feet. A female may require 10-15 years and a male 8-12 years to reach these lengths. Courtship begins in early April, and mating occurs in May or June. Females build a mound nest of soil, vegetation, or debris and deposit an average of 32 to 46 eggs in late June or early July. Incubation requires approximately 63-68 days, and hatching occurs from mid-August through early September.